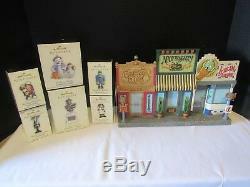 The Hallmark Hauntington Deadwood Street Shops NWT and all Ornaments Never Displayed NIB. 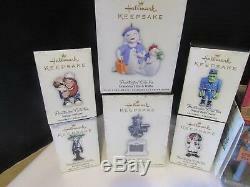 This is a Hallmark Halloween Display for ornaments. 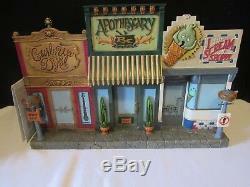 The three shops are Curl Up and Dye, Apothescary and I Scream Shoppe. To activate sounds and lights, push one of the three buttons located on the right side of the base of the building - there is a different saying for each of the stores. After the voice is finished the lights will automatically turn off after 20 seconds. When the slide switch is on the "on" position, the lights will stay on indefinitely. The ornaments are in mint condition never opened, never used. Ms Bonnie and Bones (set 2). Gramdma Tillie and Willie (set 2). 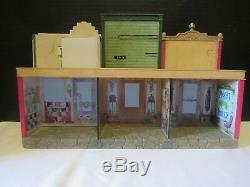 Street Shops are NWT and Ornaments are NIB. These items have never been displayed. 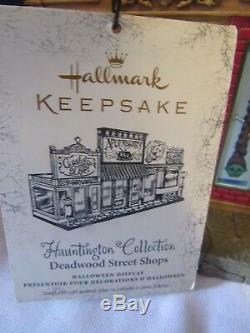 The item "Hallmark Hauntington Deadwood Street Shops And All Ornaments NWT NIB" is in sale since Monday, July 30, 2018. This item is in the category "Collectibles\Holiday & Seasonal\Halloween\Current (1991-Now)\Decorations\Other Current Halloween Décor". The seller is "updogaz" and is located in Hackensack, New Jersey. This item can be shipped to United States, Canada, United Kingdom, Denmark, Romania, Slovakia, Bulgaria, Czech republic, Finland, Hungary, Latvia, Lithuania, Malta, Estonia, Australia, Greece, Portugal, Cyprus, Slovenia, Japan, China, Sweden, South Korea, Indonesia, Taiwan, South africa, Thailand, Belgium, France, Hong Kong, Ireland, Netherlands, Poland, Spain, Italy, Germany, Austria, Bahamas, Israel, Mexico, New Zealand, Philippines, Singapore, Switzerland, Norway, Saudi arabia, Ukraine, United arab emirates, Qatar, Kuwait, Bahrain, Croatia, Malaysia, Brazil, Chile, Colombia, Costa rica, Dominican republic, Panama, Trinidad and tobago, Guatemala, El salvador, Honduras, Jamaica, Antigua and barbuda, Aruba, Belize, Dominica, Grenada, Saint kitts and nevis, Saint lucia, Montserrat, Turks and caicos islands, Barbados, Bangladesh, Bermuda, Brunei darussalam, Bolivia, Ecuador, Egypt, French guiana, Guernsey, Gibraltar, Guadeloupe, Iceland, Jersey, Jordan, Cambodia, Cayman islands, Liechtenstein, Sri lanka, Luxembourg, Monaco, Macao, Martinique, Maldives, Nicaragua, Oman, Peru, Pakistan, Paraguay, Reunion, Viet nam.